Subject: Apple wants to be Cray? geez, look at the wannabe-hip-and-trendy new Mac "pro"
Seymour Cray used a round cabinet design to minimize the wiring distance between any two points in the chassis. 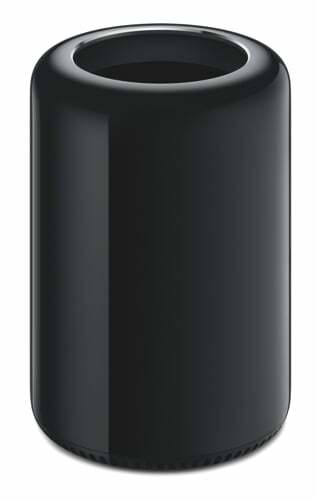 Apple's round design is just ... some sort of artsy-trash kind of thing that would look more appropriate in an art show than on a computer user's desk. And at $3000 (which does not include a keyboard or mouse, and certainly not a monitor) it's probably twice the cost of a non-fruity computer of equal power. Subject: Re: Apple wants to be Cray? Yes, trashcan like, but on the other hand, is there any microsoft workstation that is beautiful or does not look like something that hosts the hardware that manages an assembly line? Anyway, haters gonna hate and I wouldn't want to buy a machine in this price class anyway. Fill it with water and add flowers. seems as if that can serve a lot of screen real estate? Speak for yourself. I have a full size server rack next to my desk. Seems I wasn't the only one thinking that this Macintrash was turnable. It isn't. Still, the ports have illumination. 1. OCD nerds which fix every single cable to everything solid in reach with these plastic cable fixers. Wanna move the machine 5cm to the right? Nope, connected to the table/heating/apprentice. 2. Idiots that weave every cable around every other cable in vicinity. Wanna move the machine? Not without disconnecting every single cord and untying the gordian knot. I'm pretty sure that cabels weave themselves around each other to make one huge knot when they're left unwatched for too long. I am a proud member of the first group. To be honest, I wish I could have a computer without a floating keyboard. Built in to the desk would be preferable. Nothing must move, ever. As long as that keyboard was clicky. Very important! Dear lord...it's IG's dream desk....it *does* exist! I guess its a screenshot from the first tron movie. ding, ding, ding... We have a winner! Would you be disappointed if I said I didn't like it? Glass desks are not really my thing. And as Aahz pointed out, that keyboard isn't clicky. Nah, just popped in to my head when the discussion turned to computers in desks and all. I know nobody noticed, but Apple released some new products this week. One was a smartwatch with ho-hum specs, and the other was a non-Android phone with a slightly larger screen than their previous non-Android phone. If this is the best they can do without Steve Jobs ... they're toast. Yeah, saw some bits of a video with the watch.